I know this sounds like the tiniest of triumphs in a world of people who have respectable accomplishments to be proud of, but nonetheless, it brings me great pleasure to announce that I have found a pumpkin soup that meets my approval. Yes, I know, who talks about pumpkin soup in November? It seems like strictly an October affair. Pumpkins crowd the markets, and the people gather round with an evil glint in their eyes, eager to carve them up and roast their innards, mwa-ha-ha. You can barely turn your head without finding another half dozen pumpkin recipes, and oh, I know, I’ve spread my share around. Alex and I bought three smallish pumpkins to carve this year, but the weeks leading up to Halloween were chaotic and we never got to them. Feeling guilty that they were about to go to waste, I roasted and pureed one and a half of them (and stupidly deleted the pictures before, uh, downloading them from the camera), before deciding it was an absolutely excessive amount of work and entirely not worth it. I hear everyone goes through this same process once in their lives. Nonetheless, I have cups and cups of puree, and I decided it time to find a pumpkin soup I can actually get along with. Your see, I pick on a good lot of them. I don’t like them sweet. I don’t like them with cinnamon or warm spices. I don’t like them with cream. I don’t like them too smooth and I especially don’t like them boring, like warmed pumpkin milk. Suffice it to say, I don’t eat a lot of pumpkin soup. But this is about to change. This soup is loud. Beefy, spicy, smoky, textured and complex, ten times better than I even knew pumpkin soup could be. It has no cream. It is thickened by coarsely-pureed black beans. The pumpkin puree is just one star in an ensemble cast. With a salad and a crusty piece of bread, it is substantial enough to be a meal, and I cannot wait to eat it again tomorrow, which is actually somewhat inconvenient, considering the whole new recipe every day thang this month. Fear not, though. I have something else up my sleeve, but you knew that. Don’t I always? In a food processor coarsely puree beans and tomatoes. In a 6-quart heavy kettle cook onion, shallot, garlic, cumin, salt, and pepper in butter over moderate heat, stirring, until onion is softened and beginning to brown. Stir in bean puree. Stir in broth, pumpkin, and Sherry until combined and simmer, uncovered, stirring occasionally, 25 minutes, or until thick enough to coat the back of a spoon. Just before serving, add ham and vinegar and simmer soup, stirring, until heated through. Season soup with salt and pepper. Serve soup garnished with sour cream and toasted pumpkin seeds. Most pumpkin soups send my taste buds into snooze mode, but this one looks interesting. And the photos are great. omg i totally agree on elise’s pumpkin seed recipe… sooo good ! I used olive oil tho.. like it matters… the cooking in the brine was a fab idea! Ty for turning me onto her site, she’s a fellow northern californian and its nice to have something familiar in the food world that relates to our seasonal items. oh yeah, IÃ‚Â´m with you all the way in pumpkin and squash preferences, no extra sweetness in there for me unless IÃ‚Â´m using it for dessert, which i donÃ‚Â´t now that I think of it… but anyways, IÃ‚Â´ve just tagged this recipe to try it, but youÃ‚Â´ll have to wait half a year for me to do it since IÃ‚Â´m in the middle of spring right now! Oh, and I need to send you some tips I found in Cookwise about tart doughs, do you have that book? If not, do get it. I love the colour of pumpkins, and canÃ‚Â´t resist them, and once home I remember that itÃ‚Â´s the dullest, most tasteless vegetable ever, and kick myself. But in tomato soup I like it. This sounds likea good idea too. Congratulations (from a longtime lurker) on the great write up in the Boston Globe today! Well deserved. I love pumpkins and can eat them year round, but you are right – all that work! And yet, pumpkin soup is just fantastic fare, methinks. I have a pumpkin we were going to carve for the first time in my life (yes, russian girl missed that experience) and we never got around to it. Must step up and gut that pum’kin now. Speaking of squashes, I finally got the guts to cut, quarter and gut my butternut. And it wasn’t bad at all! And then I decided to make your tart, but thinking myself clever, used puff pasty dough i had in the freezer to be a good resource user – BIG HUGE AWFUL mistake. It was SUCH a disaster. I felt all defeated. I’m using your pastry dough next. I love any squash soup. Actually, I’m trying Pumpkin Lobster Bisque for lunch. Are you jealous? We have a place in the tunnels of Houston, our underground secret city, that serves this delectable soup only on Wednesday. I found out about it last week and I’ve been counting down the days until I could my mouth on a spoonful. Now, I have another soup recipe to add to my collection of soups to make this winter. And, I think pumpkin is good for all of fall and winter. Probably not the place to ask this but I will always. Just wondering if you own a KitchenAid mixer, and if its a Artisan or professional? I’m wanting to buy one or the other, but herd that the Artisan breaks down after a few years. Marce — Yes, that’s it. I don’t like it when naturally sweet things are made sweeter in non-dessert foods. I like them to be contrasted. I don’t have that book–I’ll put it on my Wish List! Radish — Oh no! re: puff pastry. I’m sorry it didn’t work. We must get you over your pate brisee fear. I promise, that summer disaster was all about the heat and humidity (no matter how cold your apt. was) and had nothing to do with you. That galette recipe is a great pastry gateway, anyhow, because it never fails. Mrs. Dolce — I have the Artisan, or classic one. Believe it or not, when I did my wedding registry a couple years ago, I didn’t eve KNOW about the different models, or I might have opted for the pro. However, I don’t use it a lot–in fact, most embarassingly, I only unwrapped it earlier this year. Great for doughs and cakes though! Wow that sounds amazing! I wonder if I could use Butternut Squash puree instead of pumpkin? And bacon instead of ham? B/c then I would have all the ingredients in my house right now, and I could make it for dinner tonight! Oh well, there’s always next year. Ok, that looks like a pumpkin soup for me. Like you commented to Marce, I don’t like sweet in non-dessert foods either. Too overwhelming for me. Um, YUM! My pumpkin streak was on a bit of a lapse, so I’m snatching up this little ditty post haste. Any ideas to sub for the ham? It squicks out the hubs for reasons unknown. Well, the reason is known (“It’s just so PINK.”); I just don’t get it. Xani, RA — I definitely think you could swap butternut squash puree. Would you believe I saw it canned at Whole Foods this week? Brilliant, I think, for people who hate the work. sometimes when you get the mail and you see the package has arrived that you’ve been waiting for.. do you tear into it first or save it for last to enjoy it? I save it for last… just like this blog! I’m making my grocery list right now. I adore your blog. Interesting. I normally don’t like pumpkin soup either. I may have to give this a try. Very soon, as I have a lot of pumpkin just sitting around. Deb, My DH is a vegetarian, so I need to exclude or swap out the ham. I was thinking maybe mushrooms instead? What do you think? I’m a firm believer that pumpkin can be eaten all fall long – not just in October!! This soup sounds delicious, and very different than any other pumpkin soup I’ve seen!! Hi Susanne — I think you could, but because it is mixed in in the end, for just a minute, I’d make sure they are already cooked, sauteed or whatnot. The ham could also be omitted entirely, but I did like the extra texture. I think mushrooms would be great. Not being much of a pumpkin-pie fan–too slimey–this recipe intrigues with its balance of sweet, salt and heat. Thank you for your blog. It’s lovely and beautifully written. given ur list of “wants” for pumpkin recipes…i think u should try some japanese varieties, they do great things with pumpkin that dont involve extra sugar or spices… soo good. if and when i find a good one, ill be sure to come back and share! That reminds me: Does anyone have suggestions for my remaining 5 or so cups of pumpkin puree? I’m a tad nervous to use it in baked goods–it has a slightly higher liquid content than the canned stuff, more like mashed potatoes, so that ix-nays me saving it for my pumpkin cheesecake later this month. But what else? I’d hate for my labor to be as pointless as it seemed at the time. Easy! Just cook it down to eliminate the excess liquid. I do this all the time to intensify the flavor of even canned pumpkin! Would draining in in a sieve help get the texture needed for baked goods? I have used the homemade puree in muffins and pancakes with good results. I have also used it as an add on, for things like the middle of already made crepes? I just made this soup this weekend as well – without the ham, with homemade vegetable broth and I added some hot sauce at the end instead of the sherry vinegar. I think it’s my favorite soup of the fall. I also didn’t puree the beans and used chopped tomatoes because I wanted the soup to be a bit more stew like. I’ve got some in the freezer and I’m going to have to get it out this weekend already because it’s so good. Note to self: buy a pumpkin! This soup looks too good not to make! Someone link the Boston Globe article! I’m just finishing the wonderful batch of pumpkin butter from the recipe you posted not long ago. (I made the awesome granola, too …) I’ve put it on just about everything — yogurt, ice cream, oatmeal, pancakes. I’m thinking about hooking up an IV soon … How ’bout whipping up another batch of that with all of your hard-earned pumpkin? Here is a link to the article in the Boston Globe – Congrats! I have yet to try a pumpkin soup even though I love everything else made of pumpkin I have ever tried. It’s tragic, I know. Shall this be the first? I’m thinking so! I made this tonight for my family and they love loved it. I served it with some fresh mango salsa, sour cream and cornbread. It was amazing, warm and very filling! Update – They sold out of the soup before I got there. Now, I have to wait until next week. Tell Alex to get to Houston on Wednesday of next week. I use pumpkin puree (admittedly the canned stuff, which I’m missing this year in France) instead of sweet potatoes in a recipe that started with the sweet potato quesadillas from The Moosewood Restaurant Cooks at Home — enough interesting spices and flavors to be not-cloying, and quick an tasty to boot. Actually, I often add a shmoosh of black beans to some of the quesadillas if I have them in the fridge, so probably not for the day after your yummy-looking soup. The salsa and Mexican flavors feel new with the pumpkin, but they don’t clash. BTW, for weeknight dinners I always just add fresh cilantro and a splash of lime juice to canned salsa and voila! fresh goodness is ours. I agree that it’s hard to find a good pumpkin or squash soup. I find most disturbingly sweet,reminiscent of pureed squash baby food, and not at all appealing, but this one sounds fantastic. I’m looking forward to trying it. And that first picture of the soup? It looks completely delicious. I combined Elise’s brined pumpkin seed recipe with Ouvo’s 3-pepper spiced Pepitas recently with great success as an acompaniment to roasted pumpkin soup recently too. They add such a nice texture! I do love pumpkin and am always loking for another bean recipe, especially black beans. I’ll have to try this. A dash of hot sauce will heat it up. Discovered your blog from the Globe Article, comforting to find other cooking obsessed souls out there. Great Job! Next time you have that pumpkin don’t puree, go stew instead of soup! Madhur Jaffrey’s World Vegetarian (1999) cookbook has a Cuban White Bean & Pumkin Stew which I’ve made for years (once adapted for chili contest held on a Friday in Lent – aka Catholic No Meat Days). It is great & I’m no vegetarian but even Vegans I know love this one. Take 1 lb white beans soak overnight add with 2 cups diced pumpkin (or other squash) & 5 cups water in large pot. Bring to boil, partially cover, simmer gently 40-80 minutes until beans are tender. Next step is the key and where you can go nuts with variations. While beans soften, make a sofrito by sauteeing on medium high heat, in 5 tblsp olive oil, 1 medium onion, 4 garlic cloves, & 8 to 10 Cachucha peppers (a caribeean cousin of Habenero, citrus flavor without the heat – I’ve never found and use 2-4 Poblanos or Anaheims intead – Jaffrey suggests simmering some lemongrass with beans to replace citrus notes – I add lime juice at end) all finely diced . Stir briefly, add 1/4 cup finely chopped Culantro (also never found) or substitute Cilantro. Add 1/2 tspn Cumin (I use more) stir once then add 1 cup canned tomato sauce (diced tomatoes alternative), bring to simmer & turn heat down to gentle simmer stirring occasionally for 10 minutes. Add Sofrito to beans. Canned white beans will cut cooktime (add later to simmering pumpkin & use less water) . Enjoy! btw last year I discovered a “hard shell” pumpkin at local farm market (about 3-7 lbs each), it was tougher skinned than carving pumpkins, flesh is less watery and strong pumpkin flavor also assume would make puree less watery. Not sure what the technical name for these are and I haven’t seen too often – couldn’t find in store this year then found my local garden center was selling them as “decorative pumpkins”. They also store well, ie don’t rot when kept in cool spot (had one in basement pantry for 4 months last year and made great mid winter treat). hi deb! I just have to say, I’ve been a follower of your blog for awhile now, but haven’t yet made anything until I saw this soup. and it was a fabulous find. being vegetarian, I too nixed the ham and used a vegetable broth. I also added more black beans. I wished I had added more pumpkin, thinking it would’ve made it a little thicker, and I could’ve used more pumpkin flavor. Im a newby to your blog…just found it last month…LOVE your freshly savvy writing style, exquisitely tempting photos and uniquely Better than everybody elses recipes!!! (I am serious) Your blog is comfort food to me and my favorite treat when returning home from work! Thank you from the bottom of my stock pot. Just made this deeply satisfying soup last night. WOW! This is BIG on savory latin flavor that melded so well with the pumpkin….loved it! I used freshly ground cumin seed (that I smashed in my mortar and pestle). Also, I didnt have any sherry or sherry vinegar, but instead used leftover birthday champagne and some balsamic vinegar. I even had some of the soup cold this morning….maybe even more delish the next day! First homemade pumpkin soup that I actually liked….I think I am going to officially declare November. Soup Month :) and try as many soups and stews as possible. Good for us and good for our figures too! Heat a soup pot over medium heat. Add oil. When oil is hot, add onion. i made this last night, leaving out a few things like the sherry because i didn’t have it and used pancetta cubes instead of ham, but it was seriously phenomenal. i actually made another pumpkin soup at the same time and it wasn’t bad, but it wasn’t this. thank you SO much for sharing this recipe, i was literally sneaking in some with the stirring spoon. Oh, and i should’ve read the bit about where you pureed the pumpkin more carefully because as much fun as it was, it was such a mess and i couldn’t taste the difference in the cupcakes i made either. oh well, at least i have bragging rights. That looks really good. I have a pumpkin here that’s just begging to be roasted, so…hmm. 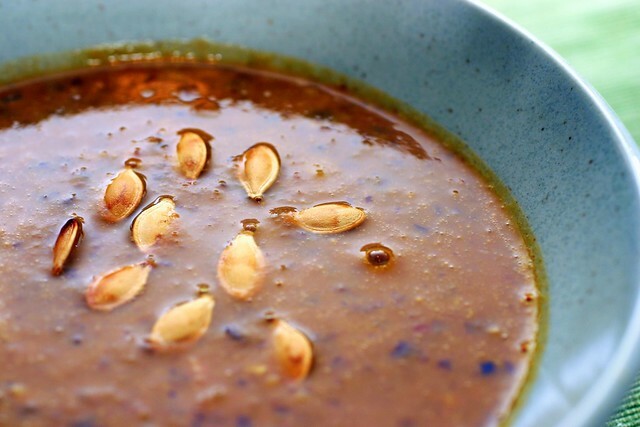 Have you tried pumpkin soup with red curry paste and coconut milk? That’s quite an assertive pumpkin soup that I’m rather fond of. holy crap, this soup is good. i ate two bowls for dinner last night and one for lunch today. thanks for unearthing it. i love that it isn’t sweet. I tried this over the weekend – so good! I actually found it not quite pumpkin-y enough so I added more puree. I think next time I’ll add even a little bit more. Also, I’m on Weight Watchers and this recipe is very low points!! Haha – I love when I can actually make your recipes because a) they’re easy enough b) I have the ingredients in my shoebox-sized NYC apartment and c) I can eat it guilt-free! I think this sounds good with hot chorizo cooked at the beginning and it’s fat used to sautee the vegetables and added back in at the end. Since I have some hot chorizo that’s what I’ll do. Made this for dinner last night…and it was DELICIOUS!!! I may have to add a little more pumpkin next time, but otherwise awesome. Thanks a lot for the recipe! This is the recipe that brought me to your website for the first time. I had some out of the freezer again for dinner last night and it is just as delicious as when I first made it. And there’s a cup left for lunch, which will definitely warm up this sleet-y winter day. Thanks! I found your website when my daughter called to tell me about the pumpkin and black bean soup recipe she’d just made and how fabulous it was. Then she told me where she got the recipe. I’ve been hooked ever since. I’ve been planning to make this soup but just now got around to it. My husband said it was delicious and I certainly agree. Thanks so much for all the food, recipes and information. It’s terrific. Hi! Been reading your blog for a few weeks (since your Wedding Cake adventure – that got me hooked), and thought I’d try making something from your recipes. Its pumpkin season here in Australia (they keep being on special at my local organic place), so I thought I’d see what you had with pumpkin. I’ve never seen a soup like this. It was tricky to get the ingredients here (black beans & sherry vinegar in particular, and also I don’t know that I’ve ever seen pumpkin puree in cans, but I made some with no problem). Anyway… IT WAS YUM. Invited my neighbours, who donated one of the cans of black beans … and we all loved it. I made it without the ham, and it was still very yummy. About to go have some more for lunch. Thanks for your great blog. Just finished a beautiful dinner of this soup, sourdough bread, home-made samosas (from a coworker’s husband), and a glass of voignier, and holy cow! So good! Being vegetarian, I subbed out the beef broth for a veggie “beef” broth powder I found at Caper’s (aka Whole Foods to those outside Vancouver) and replaced the ham with veggie Canadian bacon (which was awesome and just as smokey as I’d hoped). I also finished it by topping our bowls of soup with slivers of applewood-smoked cheddar, which gave it a little more creaminess and smokiness and made it taste a little meatier. This was the best pumpkin soup I’ve ever had! I also usually strongly dislike pumpkin soup, and really (don’t hate me!) squash in general. I don’t like the texture or the (lack of) flavor, but when the husband said he wanted squash, I knew this was the recipe I had to try. And you, whoever is reading this: MAKE IT! I’ve made many recipes from this site, and they never fail to please, but this one was especially stellar! Enjoying several bowls of this now, delicious!! I used veggie broth and skipped the ham (although I think I will definitely add mushrooms next time for texture). Fantastic!! I thought this was very good. I took another commenter’s suggestion to brown some chorizo and use the rendered fat instead of butter and the browned chorizo instead of ham. And I used chicken broth instead of beef broth. I was surprised by how much cumin was called for, but it was good. I couldn’t really taste the pumpkin though. This is a great recipe! I’ve made it before from Epicurious. Why do you think making pumpkin puree is too much work? It’s so easy. Just cut in half, remove seeds, roast, scoop out pumpkin. I find there’s really no need to drain the pumpkin in cheesecloth or do anything more than just mash it with a fork. In fact, puree straight from the shell has a much nicer texture and makes a particularly good pie. Just one girl’s opinion though. Love your blog. delish. even my children loved it. didnt have the sherry. oops. but will add it next time! this was spectacular… i added some chipotle, which gave it a great smoky under-flavor. one of my all-time favorites. This soup is spectacular. Made it for a church dinner: 55 incandescently happy women. I was looking for cauliflower recipes and I came across this recipe for pumpkin black bean soup. I have been making this same soup for a while. It’s wonderful. It’s the only reason I have to keep sherry in the cupboard. I think your recipe looks very good I make mine much the same but no sherry or beans. Might try that. Oh my goodness, this was good. I modified it just slightly to fit what we had on hand, and it is oh-so-tasty. The pumpkin kind of disappears in it (though to be fair, my pumpkin did not yield 1.5 cups of puree) – it just tastes unbelievably rich and complex. We will have great lunches this week! Just finished this up this afternoon. It’s fantastic. I followed the recipe to a “T”, but skimped on the onion by about a 1/4 cup (the remnant hunk I had in the fridge only went so far), and omitted the ham (didn’t miss it all, though I might experiment with some crisped and crumbled prosciutto when I reheat for dinner). Like others, I didn’t get a strong pumpkin flavor (used 1.5 cups of fresh puree), but also like others, I didn’t care one bit. Don’t be tempted to skimp on the cumin either…I might have freaked out a little bit when I added it to the onion/shallot/garlic sautee…it’s a very present flavor, but the dish needs that smoky element. One final note: I did go out and buy a bottle of Sherry just for the recipe. I don’t think it would be a failure to, um, not do that. Wow. Reheated the soup tonight (it reheats very well), and served it with a warm French baguette, the brined pumpkin seeds, and crumbled crisped prosciutto. It was over-the-top good. Boyfriend heartily approved. Terrific soup, we will definitely be making it again! This is seriously good soup. I just enjoyed a bowl of it while watching the first snowflakes of the season drift past my window. Thank you for the recipe! I just found this site yesterday and love it:) I was looking for something to make dinner on a dreary October-that’s-feeling like December day in Minnesota. I left the beans and tomatoes whole and called it pumpkin chili-and put in some leftover bratwurst from Oktoberfest. Thank you! About the KitchenAid. I have a classic one which I think is what they are calling “Artisan” now. I wish I had ponied up the money for the Professional model. You see, I thought I was making an “entry-level” purchase but now I’ve had mine for over 20 years, use it quite a bit and I love, love, love it. The only problem I’ve ever had is that I bought the dark green one–not understanding that I was making a commitment that lasts longer than most marriages. Wish I had least opted for black. Made this this afternoon – SO GOOD. I boosted it with a healthy dose of cayenne & red pepper flakes. I also added a bit more than the 1.5cup squash (I used butternut squash intead of pumpkin) and it is just this underlying sweetness that counters the beans, cumin & pepper wonderfully. Perfect late fall soup! Made this tonight, very quick easy after work dinner. Really enjoyed it. Didn’t have sherry vinegar (and it was $11.99 at the grocery store) so I used red wine vinegar instead. I just made this soup, with vegetarian substitutions. Left out the Ham and used Mushroom broth instead of beef broth. Turned out fantastic. Thanks! I can also vouch for this recipe’s deliciousness! I’ve made it a few times. Once I put in a bunch of cayenne pepper, mistaking it for paprika, and it was superspicy and great. It’s a nice alternative to chili I think, with the same heartiness. I have been making this exact recipe for years but didn’t know it’s source as my recipe is hand scribbled on notebook paper. ( There were probably too many witnesses in the dentist’s office waiting room for me to tear out the magazine page!) I’m like you in that I don’t like wimpy runny pumpkin soups. My food processor seems to over-puree the beans and tomatoes so I started mashing and/or chopping them instead to keep the soup more chunky. The last time I made it, I ‘borracho-ized’ it with some dark beer! MMMM, I’m sold. Ok, I’m definitely a fan. Saw this recipe last October and it’s been on my make list since then but I just FINALLY got around to making it IN JANUARY so I had to use canned pumpkin since there aren’t many pumpkins at the farmers markets this time of the year ;) It was so yummy. I would compare it to a more liquidy (is that a word?) chili when it comes to consistency and flavor. I agree with the above post that the pumpkin does kind of get lost in there. However, it did have a complex sweetness with the sherry and hidden pumpkin which made it just delectable. I did go out and buy the sherry vinegar which I’m happy I did. It added a bit of acidity which I think it needed. I imagine I’ll be making this again & again so that justifies buying it in my mind. This soup was ridiculously good and simple to make. My family loved it, and I am glad to finally have a way to get them to eat squash in some form. Deb! You amaze me again. I made this last night and it was fantastic. And it’s a good thing it was – it made a ton! Thank you! I made this several nights ago, and must say I was pretty much in love with it! The flavors, as you said were robust, meaty, smokey… some of the things that a soup should be! When I told my boyfriend I was making this for dinner, he replied: “That sounds interesting…” But once he tasted it, he could not deny how good it was. For accompaniment, I did add the brined pumpkin seeds, as well chopped cilantro,and crumbled queso fresco (fresh cheese). DIVINE! I swoon over your pictures and story telling and have made so many of your recipes. I hear this soup cooking as i type this. I swapped the sherry with mirin – hope i haven’t put too much in. And i swapped the cans of black beans with a tablespoon of rinsed fermented black beans for taste. I think its a winner…i just need to thicken it now. is there anything to substitute for the sherry or the sherry vinegar? this looks soooo good! You could use wine and wine vinegar. If the issue is the trace alcohol in either, just skip it but you would miss some of the dynamic flavor. Its bubbling away on the stove now, been “taste testing” every few minutes! Very yummy. You are my go-to blog for interesting and exciting food. I have been raving about you on my blog for awhile now. :D Hope you don’t mind. In New Zealand we rarely use pumpkin for sweet food, which seems odd. We don’t have canned pumpkin here so that may be part of it. We have it in roast vege, salad, muffins, scones and soups mostly. 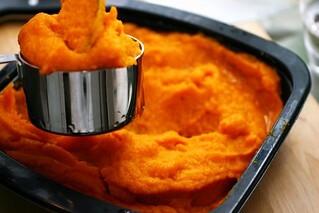 I may try pumpkin pie with my leftover pumpkin mash, get in the spirit of all things pumpkin in the US! Although it’s not exactly seasonal, I saw this recipe and was super excited to make it. However, I accidentally put 1/2 cup of sherry vinegar in it! I can tell this would be really yummy soup if I hadn’t put twice as much vinegar in it than was called for….is there anything I can do to save the soup? I would try cooking it longer, so that the cooks off a bit. It might end up on the sweet side, but it will at least be less sour/biting. I don’t know.. I guess I am one of the few that doesn’t mind roasting my own squash. I’d just as soon do that as open a can. But anyway.. loved the recipe. Used Spanish Chorizo instead of ham and a different squash though just as vibrant an Autumn color. Was surprised that the soup came out a little less Autumn-y and more black bean in color. I roast and puree(and usually grow) my own pumpkins every year. It actually is not that much work, you get fabulous seeds to roast and salt and EVERYTHING tastes so much better than the stuff that comes out a can. Has anyone tried this in a vegetarian version. Using veg. broth and no ham? I actually like using the veg. paste because it is a little “meatier” in flavor, so I think I’ll try that but would love to hear if anyone tried with other substitutions. I completely forgot the sherry and the vinegar, and this was still amazing. Excellent call on the roasted pumpkin seeds! I actually used pepitas, and they were/are amazing (I took them into work with me to have with some leftover soup for lunch… having them right beside my computer is not the best idea ever). I’m not a huge cumin fan, but the hubs is, so he was super excited when he smelled that addition… it was amazing. Everything blended together SO nicely! Also, thank you for turning me on to Better Than Bouillon! (Did I spell that correctly?) That is such a lifesaver to have in the fridge when a recipe calls for a broth or stock I don’t usually have on hand. Used a little less than they called for to make the beef broth (The jar recommends 1.5T for a quart of stock, but I just used 1T since I recall it being pretty salty). Yum, delicious, fantastic, wish it was lunchtime! I made this last night for the third time and changed things up a bit — all veggie (would’ve been vegan w/o the butter), used white beans instead of black for a prettier color, and threw in an extra can of pumpkin. I think this is the best version yet! Made this last night! Absolutely wonderful – thank you!! And like you, I had been on the pumpkin soup caper for the past 5 years and each time was a strike out with my fiance. This year, I got a TWO THUMBS UP!! And like you said – there are leftovers that are droolingly being looked forward to! I made this soup yesterday for my sons 3rd birthday party and it was an overwhelming success. Thank you so much for posting this recipe! I grew pumpkins in my garden this summer and it was so rewarding to use them in such a delicious, talked about soup! I can’t wait to knock everyone’s socks off at the next family gathering with your buckeyes! I made this today and it was fabulous! I did not use the sherry or ham and instead of sherry vinegar I used cider vinegar. Everyone loved it and there were many requests for recipes. I just made this recipe, with a few tweaks of my own. 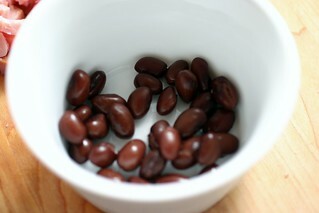 I used one less can of black beans, and 1/4C apple cider vinegar plus 1/4 cup water because I didn’t have any sherry. I also diced up 1/2 cup roasted red bell pepper. This was delicious, even with my modifications!! THIS IS SO SO GOOD. I didn’t have the ham or sour cream, and I substituted balsamic for the sherry vinegar, and it was delicious. My sister agrees, it’s a keeper. I think it’s more of a bean soup than pumpkin, but it makes me happy there were a couple heaping cups of fresh pumpkin puree in there, b/c pumpkin is healthy, right? The butter is totally justified if there’s pumpkin in there :) I love that the soup is rustic and not totally blended, with its tender nuggets of savory onion (I used half red half yellow.) Deb I think it’s official now, Smitten Kitchen is my go to recipe blog. Such a solid variety of recipes to choose from, so happy you’re sharing them, thanks! This looks fantastic! I love the orange color, so appetizing. And must be great with beans.Love the idea of pumpkin seeds as topping too. This reminds me of my favorite quick/easy/delicious winter dinner: peel and cube a butternut squash, sweat it with a chopped onion and some garlic in a stockpot until soft, mix in 1/2 (or whole) can of coconut milk, add curry powder, salt, and a splash of sriracha to taste, puree the whole thing (I love my immersion blender!) and then add a drained can of black beans and heat through. The whole thing takes about 30 minutes and is healthy, warming, and DELICIOUS. I was curious as to your use of onions and shallots in the same dish. I’m more familiar with the use of shallots when you want that onion-y flavor without as much texture and onions for more of a crunch. I was wondering if you have an opinion on this and the advantage of using both in the same dish. (Also because onions are cheap as dirt and shallots can be expensive little buggers). Hi, Deb – I made this soup today and it’s sitting on the stove simmering away. It tastes yummy so far but doesn’t look anything like your pictures. It’s definitely more of a bean soup than pumpkin (can’t really taste or see the pumpkin). I’m wondering if it should have been 3 cans of pumpkin and 1 can of bean????? I made this tonight and we loved it. I used just a hair less cumin and felt it was just right. I agree with the above poster that the pumpkin was basically an invisible flavor component- I think it added a complexity and richness that wouldn’t be there w/ a plain bean soup, but I’d definitely say beans were the star player. I loved the addition of the sherry- very nice touch and it smelled heavenly as it simmered. 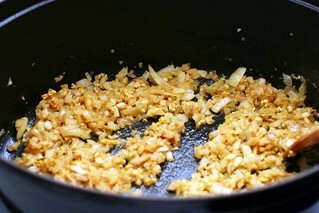 I also loved the use of all of the onions/shallots/garlic–loads of flavor there. I made this tonight and it was amazing! I substituted the cubed ham with sautéed Andouille sausage and paired it with a cauliflower, bean, and feta salad. Delicious! Better Homes and Gardens just listed a pumpkin and bean soup recipe, but this one sounds better. Your comment about liking bold flavors with your pumpkin made me think of another recipe…Nigella Lawson’s Thai Yellow Pumpkin and Seafood Curry (http://www.nigella.com/recipes/view/thai-yellow-pumpkin-and-seafood-curry-172). I made it once last year. It’s not exactly soup, but it’s definitely in your face! Speking of exciting pumpkin soups, Deb, you should try dhal pumpkin soup. Mix any left over dhal from your Indian take aways (or make yor own) and combine it with some pumpkin puree and either broth or cream. Definitely not your usual pumpkin soup and awesome on a cold day! Elwen — That sounds so good! Made it with homemade frozen chicken stock and frozen roasted sugar pie pumpkin. Delightful! Did puree the whole nine yards…served w/ tortilla chips! We made this last night and it was fantastic! We used fresh pumpkin (and more) and slightly fewer black beans. Here’s our adaptation, for those with a fresh pumpkin they’re hankering to cook. I am pretty excited about the link to this recipe from the pear crumble post… I just received two small sugar pumpkins from my mother’s garden on Sunday. On Tuesday, my CSA box came with yet another pumpkin…. Here I come soup! I’m new to smitten….and am in love with each recipe I have made thus far! This soup is phenomenal! I never thought that pumpkin soup could taste that way. Even my meat and potatoes husband loved this soup! Also made the pumpkin pie last week…heavenly. You are making me look like a rockstar! I can’t wait for the book. Thanks for all your hardwork. Love the soup, shared some with my under-the-weather mom and she brightened up appreciably! I’ll echo what Amanda said above me: cannot *wait* for your cookbook! I know you’re working hard on it as well as taking care of everything else in life. Best to you!! This sounds like something I’d LOVE! I’m with you that pumpkin/squash soup is always too sweet. This looks great with the black beans, tomatoes, etc. Can’t wait to make it with those 2 pie pumpkins from my CSA that I never know what to do with because I don’t bake much. Thanks! I made this and it is so, so good. Like other people have said, this recipe doesn’t sweeten the pumpkin; it’s savory and delicious. However, I found it not quite pumpkiny enough for my taste, and next time I might try adding another half or full cup. Still, so so good. Such a great soup!! I might have ignored quantities and through in what I had for quantities (no point in using only 1/2 my can of pumpkin puree… toss it all in), and it still turned great!! Next time I might try getting some honey ham instead of regular, so there are little sweet chunks throughout the savory soup. I’m going to try this tomorrow and use dried black beans ala the VERY similar recipe in The Essential New York Times Cookbook. Interestingly, the NY Times recipe came out 10 years before the Gourmet version. Thanks so much for your recipes!!! I’ve tried four or five and all have been wonderful. I haven’t yet found a black bean soup that I really like…most seem to be too watery or just not enough punch. This one turned out great…the pumpkin taste is not strong, but it sure adds to the depth of the soup. Thanks! Oh my- I’m in love! I roasted my pumpkin (3lbs)and used the whole thing, used 1 qt of home canned tomatoes,only had 2 cans of black beans… still- wonderful savory rich goodness. I thinking of the vegan version- veggie broth and diced roasted carrot? This looks scrumptious – can’t wait to try it. I completely agree with your feeling about making pumpkin puree from fresh pumpkins. I, too, did this EXACTLY ONCE, about 25 years ago – and came to exactly the same conclusion. Canned puree is actually better than fresh – less watery and a better texture – and who needs the pumpkin slime all over the kitchen. I have never been tempted to go there again. Making this as we speak…smells delicious. I too get very annoyed by the way we take a completely gorgeous, healthy and delicious vegetable like squash and monotonously saturate it with sugar and cream. I find Caribbean and South American cooks give the magnificent pumpkin a lot more dignity. This is more along those lines, and can’t wait to try. Thanks so much for all your recipes…You are my first and usually only stop when I need inspiration! This soup was amazing. We had it a few weeks ago and loved it, froze the leftovers and I have to say it was even better the 2nd time around!! 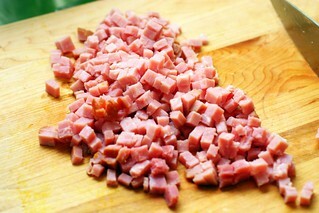 If you plan on freezing, I would cut the ham into really small pieces as the ham was a little chewy. Thanks for a great recipe – my husband licked the bowl! If I could eat soup every day, all winter, I would be a happy gal. This has been one of my favorites this season. I added some fresh and dried chiles to pack a spicier punch, and added bacon instead of ham for a little southwest flavor. Thanks for the inspiration! Typically, all of your recipes wow me, but I made this when you posted the recipe and I wasn’t thrilled. Of course, I modified this to make it vegetarian, which may have played a part. But I’m happy to report that after freezing for a month, it is fantastic! Why does that happen with soups? I volunteer on a farm and recently got some veal-ish bones from our grass-fed cows. This soup made good use of the resulting stock. I’ve just tasted it from the pot and not sure it even needs the vinegar! Thank you!! I love Black Beans and this Black bean pumpkin soup is looking great. This recipe is really nice. Thanks for Sharing with us. Thanks so much for this recipe; this was delicious. I made it with red wine instead of sherry, and no vinegar or ham. I can only imagine how much more delicious it would be with bits of ham in it! I have to say that this is one of my favorite soups on your site – my other favorites are all yours, too. But the flavors truly are beefy, loud, cumin-y, and richly satisfying, with no cream! I added chunks of sausage instead of ham. I made a pot of this several weeks ago – and froze several containers then forget they were there. I do that with all your soups (the beef barley is also fantastic) – not even bothering to label them, then I take them to work and am surprised. Great job! what could serve as a non-pork substitute for the ham? This is incredible–so many flavors and textures–and it comes together so quickly! This is going into my “keeper” pile for sure. I made this last night (with winter squash instead of pumpkin because we had a lot) and it is FANTASTIC. My husband just said, “This might be one of the best things you’ve ever made.” The kids (5 and 3) and I agree! I was just looking at reviews and saw that I forgot the cumin somehow. Ignorance is bliss – I love this ust as I made it! how did you make a puree of the pumpkin…could i sub butternut squash for the pumpkin….your blog is wonderful – I’m just making the farro and mushroom soup and the kitchen smells like heaven ! Thanks a ton !!! Hi Molly — Well, I roasted a halved, seeded, scooped-out pumpkin (maybe at 375 or 400) until it was tender, scraped it off it’s skin and pureed the flesh. However, I hear that sugar pumpkins (maybe not what we use for Jack O’Lanterns!) and red kuri squash make for the most canned-like pumpkin purees. Thanks for your reply…The boys (DS and DH) had a big roast chicken meal last evening and being veg, I wanted something more than just the roast veggies. So, I put this soup on whilst putting my son to bed, and it was ready just as my fave T.V. program started…It was just delicious and a perfect end to the week !! Keep it up, thanks so much ! Made this about 30 minutes ago and the guys have eaten half of it already! Such a good recipe. I skipped the sour cream (lactose intolerant) and it is still delicious with some warm bread. Thanks for a new fall favorite recipe! I made it without the ham (because I forgot to buy any) & it was still amazing. I also went ahead & roasted 2 small pumpkins so I could have leftovers. (My dog loves pumpkin) & I wanted to toast the pumpkin seeds too. I wasn’t too impressed w/ those..reminded me of slightly burnt popcorn. Next time I might skip that part. Anyway, everyone thinks I am an amazing cook, but really I just read your blog :) So thanks again! Thank you for finding and posting this recipe. It is so unique and delicious! Because the grocery store ran out of canned pumpkin and the winter squash was on sale, I made this with a 4 lb butternut squash instead. I added a cup more water too because I wanted to thin out the texture some. Because I am frugal I used canned light Spam instead of ham. (Hey, I’m not too good for spam!! It’s just a hot dog in a different shape.) I am REALLY happy the way this turned out- savory but still just a LITTLE sweet from the melon-esque butternut squash. Bravo on this recipe! I made this and doubled it and it was great. I think (for doubling) 1/2 the butter would have been plenty. I subbed apple cider and cider vinegar for the sherry and sherry vinegar and it tasted good! Like many, I’d consider adding another can of pumpkin, and maybe tomatoes too. Thanks-really easy and I appreciated the minimal chopping. LOVED it. Served sausage on the side for the meat lovers. Great soup! Made this soup this afternoon for my family and it met with loads of approval – my 14 year old daughter pronounced it the 2nd best soup in my repertoire (first honors go to colcannon soup, a Cooks Illustrated creation) which is pretty high praise given the number of pots of soup I am likely to make in any given month. So – thanks for the recipe!! I did alter the recipe slightly in that I used a whole can of diced tomatoes instead of a cup, but that was by accident & not intent. Results were fine. Thank you for this recipe! I made it last night and LOVED it. It was one of those recipes where I had just about everything for it already in my kitchen. I served it to my family and another family we had over for a casual get together and everyone raved over it. The only changes I made were because I didn’t want to make t trip to the market. I used pancetta instead of ham and a blackberry roasted pepper vinegar instead of sherry vinegar. Not because I thought it would be better, just because it’s what I had. This is certainly going into my fall/winter rotation. THANK YOU! Thank you, Smitten Kitchen, for saving my failed squash soup! I tried to make a squash-apple (you know, those standard ones that you hate) soup, but the sweetness of the squash + tartness of the mutsu apples made it taste like a dessert! It was really gross. I honestly thought it was going to sit in my fridge until I had to throw it out. But then I came across this recipe, and just added the garlic, beans, tomatoes, sherry, and cumin – the onion was already in there – and it transformed my former bland dessert soup into a much more exciting soup with a southwest flair. I shredded parmesan onto each bowl instead of ham – it was a great way to add the umami richness without meat. I also set aside a couple cups of the soup before adding the broth, to use as a dip with tortilla chips! Yummo. I would agree with Christina with her assessment. I added a whole another can of pumpkin and I still didn’t taste the pumpkin. The soup is still good and I’ll make it again, but just no pumpkin flavor. Thanks for sharing this recipe! I made it last night, and both my mom and I loved it. Mom commented that it tasted like a refried-bean soup—and we both like refried beans, so that was a good thing. I substituted canola oil for the butter and reduced the amount to about 2T. I’m sure the butter adds a subtle undertone, but I didn’t feel like anything was missing with the canola oil substitution. Could this soup benefit or take on moraccan spices? Alice — No reason you cannot fiddle with the spices. Deb! Delicious! I loooooved this soup, as did my husband (who declared it one of the best dishes in recent memory). Thank you for this recipe! I actually made it with the ham bone from our Christmas dinner and made my own ham stock for the base (in place of the beef broth) and used one less can of black beans ’cause that’s what I had on hand. And I didn’t have any sherry or sherry vinegar so I made some fun substitutions: for the sherry, 1/4 cup of Madeira, 1/8 cup dry vermouth, and 1/8 cup whiskey, and in place of the sherry vinegar, 1 tablespoon apple cider vinegar, 1 tablespoon port, and 1 tablespoon Madeira. Yum! I’m looking forward to picking up some sherry, but this did deliciously in a pinch. Also, loved meeting you at your cookbook talk/signing in Philadelphia. That goes down as one of the highlights of my year! Dude, I forgot to tell you! I made this soup for my church’s Souper Bowl Sunday, and it was the first to go! I had made it vegan by using veggie broth, because we have at least one avowed vegan in the parish, and I want to make sure he had something to eat. Our Token Vegan needed a nap, so he didn’t come, but people scarfed this soup. I’m new to the website and this was my first recipe that I made. The soup looks exactly like the one in the photo and is delicious. Could me the shallots and butter, but I don’t care since it was just so GOOD. I changed this recipe so much I don’t even know if I should comment! I used a whole jarrahdale pumpkin, chickpeas because that’s what I had, smokey paprika instead of cumin, and no bacon because I was too lazy for shopping. The soup was totally savoury, filling and delicious. Can’t wait to buy some bacon for it! Adore this recipe so much that now I think of it whenever pumpkins come in season! I love it with 2 tsp fresh ginger, 1 tsp turmeric. Instead of butter, it’s also great with clarified butter, coconut or peanut or olive oil, and thought about 2 tbl was enough. I use fresh pumpkin when available, an immersion blender instead of pureeing ingredients ahead of time. I think meat is a bonus, the soup really stands alone without it. This recipe reminds me of my favorite pumpkin soup. I start with a double batch of Rick Bayliss’ recipe for Roasted Tomatillo and Chipotle Salsa with addition of a roasted onion. Process it coarsely (not puree- some chunks left) and put it in a pot with diced fresh pumpkin (not puree), 26oz can of petite diced tomatoes, chicken stock and some shredded chicken or pork; bring to a simmer and throw a little minced cilantro in right at the end. Spicy & slightly tart flavor of the salsa really plays well off of the bland pumpkin. Sorry I’m not more exact about quantities; but that’s how I cook. I can’t tell you how much I love this soup!!!!! Made it twice in as many months because my farm share box kept giving us pumpkins and I’m not a huge sweet fan. I made it vegetarian and left out the sherry and once made it with fresh tomatoes. Its such a great combination of flavors, I practically inhale the stuff! I keep re-posting it other places because I want everyone to be a convert! Sorry about all the exclamation points. I just really love this stuff! Love this soup and have made it heaps. Sounds weird but fried mince is really good in this soup. Great to have in the freezer! I just made this for the first time because I had some leftover canned pumpkin puree. I only had 2 cans of beans (and no working food processor) so I mashed them with a potato masher and added a can of whole kernel corn in place of the third can of beans. I also added about a tablespoon of brown sugar and used chunks of ham from a frozen homemade honeybaked ham hock. I’m sure it’s a bit different than the original recipe but I was very happy with the result. I’m sure it would be better if my food processor were working. Halved the recipe, and even with a bunch of omission/substitutions, this is fantastic. In case your pantry is as poorly stocked as mine & you are wondering: I used just one can of beans (used slightly more pumpkin to make up lost volume), rice wine vinegar in place of sherry vinegar, white wine in place of dry sherry, no ham, no shallot (extra onion added), and tomato sauce instead of canned whole! I know, ridiculous, but this was STILL delicious. Great flavor and reheats well. This was delicious. I didn’t have any black beans in the house so I ended up using about 1.5 cups of puréed black lentils and another half cup whole. I also topped it with goat cheese instead of sour cream. Great recipe! Deb, I’ve followed your blog for awhile now, and my family loves many of your recipes. I REALLY want to make this one, but I’m confronted yet again with the dread-tomato-dilemma. My husband really doesn’t like tomatoes–taste or texture–so whenever I see a delicious recipe that calls for a can of chopped tomatoes, I put it aside and sigh. Can you (or any other brilliant commenters here) think of an adequate substitute for that can of tomatoes? This will rescue so many recipes from their unhappy exile in my collection. Thank you!! Erin — I actually don’t think the tomatoes are very noticeable here. The flavor is from the pumpkin, spices, shallot and beans. They’re more notable in texture. Regardless, you can probably skip them. You might try some well-chopped peppers instead. Or you might include them and — honestly, I didn’t even REMEMBER there were tomatoes in here until you commented about them — your husband may not even notice. Deb, you wrote back–I feel like I’ve had a brush with fame! I’m going to try it out this weekend, omitting tomatoes and replacing with some finely chopped peppers. Thanks so much! The soup is about to be done on the stove and it tastes great. I used the frozen pumpkin puree I had and unfortunately the soup did not retain ANY orange color. To be frank it looks kind of… unappealing. Anna — This soup doesn’t really keep a vibrant orange color; it’s got too many other ingredients. Only pie usually does for us, or a squash soup without a lot of other stuff in it. Deb, Can you successfully freeze this soup? I am thinking Thanksgiving and would love to make it ahead. It sounds like just what my family would like! OMG!! This is an amazing soup! I actually do love squash and pumpkin bisques, so I wondered how I’d feel about this one since you loved it because it is antithetical to those kinds of soups. Wow. Wow. WOW! We loved it! (Erin – I think your husband wouldn’t even know there were tomatoes in there since they are such a small quantity and they are pureed with the beans.) I used fresh pumpkin puree instead of canned and rice vinegar for the sherry vinegar. Since my son is full on vegetarian, I subbed smoked hickory almonds for the ham. I just chopped up a bunch of the almonds and put them on the table for people to add to their individual servings. Totally didn’t miss the ham at all. I used three teaspoons of Better Than Bouillion Vegetable Base with four cups of water instead of beef broth. My son also doesn’t like cumin, but I’ve noticed I can occasionally use a smaller amount of cumin seed and he’ll eat it. So, I did that. Deb, we have loved pretty much every recipe of yours we’ve tried – this one is no exception! Thanks for sharing such a great hearty soup. Since I got eleven sugar pie pumpkins from our garden this year, I think I’ll be making this a lot this winter. (I made your pumpkin cinnamon rolls last night!) I assume this soup freezes well too. Thanks again! This was a superb soup (thank you!) and with the cumin and tomato reminded me just a bit of your squash-and-chickpea Moroccan stew which is also delicious. The tomatoes are an absolutely genius addition…and I think they (with the cumin) give it a meaty rather than tomato-y flavor…maybe it’s what helps cut through the boredom of “plain old” pumpkin soup (I still love you babe!). I too made it with fresh squash (a mix of butternut and what I learned is “red kuri”) but I just added the cut-up raw pieces (kept some of the skin on, especially from the red kuri which is bright orange) directly to the onions and shallots and cumin at the beginning and let them sweat and soften before adding the tomato, beans, and broth…blended only half-heartedly to leave some beans and chunks of squash whole. SO GOOD. The soup turned out orange enough—actually quite lovely-looking and Halloween-y with the bits of black from the beans. And the seeds, yum! – what’s nice about brining them is that any extra stringy flesh attached floats to the top and you don’t really have to add any oil after when you bake. I am up to about a dozen sk recipes now and I can say I have never met a recipe of yours I didn’t love. You rock. Loved the inspiration this soup gave me! I made it with what I had on hand: tomato paste (had an already opened can that needed to be used up), two cans of black beans, a roasted and pureed butternut squash and no “finishing” vinegar…The addition of the Sherry to the soup is phenomenal! Can’t wait to make it again actually following the recipe! Thank you! Hi, I know what you mean by finding the right pumpkin soup! I’m going to gather the ingredients today for this! I simply don’t care for ham.Should I just omit, or substitute something else in? Hopefully it will not ruin the original flavor too much.Thank you! This was delicious! A fantastic winter option. Thanks, Deb! I have made this so many times now. It’s unique, simple to produce, healthy, and satisfying. I’m ever hopeful that you will someday do for homemade beef broth what you have done for homemade chicken broth – it is so straightforward for me now: buy the cheap whole chicken plus a package of feet or wings, cut it up (thanks for that gourmet video link, btw), throw the back and the feet/wings in the crock-pot for the uncluttered chicken stock at the same time as making the roasted chicken with dijon sauce recipe, any leftovers go in a chicken soup with the delicious broth a couple days later. All my go-to soups from SK automatically have homemade chicken broth now, but your lovely beef-based recipes still have tetra-packs from the grocery store. I use your french onion soup recipe, this one, mushroom farro soup…all are fantastic with home made broth. I would just LOVE a beef broth recipe to equal the deliciousness, ease and simplicity of your chicken broth. Did you purée a normal carving pumpkin for this? I’ve heard conflicting reports as to whether those are edible or if sugar pumpkins must be used for all cooking (both sweet and savory applications). I usually use canned. I hadn’t heard about carving pumpkins being inedible. I have a ton of pumpkins left over from Halloween and have been pureeing and baking my way through them, so I have insight. I’ve done one small “sugar pumpkin” and one big orange jack-o-lantern style one. The jack-o-lantern puree is basically the same as the sugar-pumpkin puree. Maybe the sugar-pumpkin puree is slightly more pumpkin-y, but I really can’t tell the difference. And my family has been eating it all week with no ill effects. I would say a) they’re edible and b) they’re delicious. Also, it’s really not that much of a pain to roast and puree it. And the finished product is a beautiful creamy-satiny texture and glowing orange-gold color. I’m really loving it! Made this yesterday with a few changes: I don’t eat ham so I left that out; I didn’t have Sherry Vinegar on hand so left that out; I had some of the season’s last few tomatoes from the garden so I used those instead of canned (simply chopped them up, no draining). I also only used 2 cans of black beans. Didn’t matter. This soup is delicious! Thanks, Deb, for another winner. This did not work out as anticipated for me. First of all, it wasn’t orange! I used Rancho Gordo Black Beans, which probably have a ton more pigment than the usual, and my pumpkin puree disappeared instantly, never to be seen again. I also think the beans were too flavorful for the pumpkin, so they basically erased the main ingredient. Finished product was good, but not mind-blowing. Just made this. It’s more of a black bean chili (with pumpkin undernotes) than a pumpkin soup. In retrospect that should have been obvious from the 3 cans of black beans and 1 can of pumpkin. But it’s tasty and easy to make, and I suspect, like most chilis, it will be even better tomorrow. P. S. I left out the ham because I didn’t want to include it. Thank you! I made this for dinner tonight it is a winner. I pureed baked butternut squash in place of the pumpkin otherwise I followed the recipe as written. This one will be in my recipe file. I have made this several times and I always enjoy it. I leave out the ham because we don’t eat meat and use vegetable broth. I also use only one Tablespoon butter, because I don’t see any reason to use a 1/2 stick. Not sure why some people thought this was mire like stew–mine comes out as soup and is delish. Yum!! a wonderfully comforting, filling tasty soup that helped w my glut of roasted/puréed pumpkin!!! Kids (8 and 6) both had two bowls. Only amendment i made was to fry pancetta in w the onion, garlic, shallots mix. Only did this as package of pancetta needed used! Thanks for another wonderful recipe!! Made this for the first time today. Cooked the black beans from scratch, but otherwise followed the recipe. Learned that pumpkin in a can is in the baking aisle, not the canned veggie and fruit aisle. We liked the crunch in this soup, and the hearty flavors. Roasted raw pumpkin seeds at 325 degrees for 12 minutes on parchment paper, so as not to scorch them. Thanks, Deb. As a vegetarian I would like to try this recipe with vegetable rather than beef broth and sauteed mushrooms instead of ham. What do you think of that combo? Other suggestions? I made this today and it was great, plus a good Instant Pot experiment. Steamed a whole sugar pie pumpkin in the IP. (7 minutes under pressure, while chopping onions and gathering other items.) No ham, but had a bit of bacon so used it as fat (instead of butter) to cook onions and garlic (on saute setting in the IP), plus added cumin here. Scooped pumpkin flesh while onions cooked – 3 minutes. I had some Rancho Gordo black beans already cooked, so used them in their bean stock in place of the beef stock (plus one can of chicken stock, having it around). Dumped beans, tomatoes, stock and pumpkin into cooked bacon, onion mixture and put lid back on. Set pressure to high and cooked 5 minutes. Manually released pressure and used a stick blender in pot to puree (bacon and all). Delicious with a dollop of sour cream, a few picked jalapeños and a crumble of tortilla chips on top. Fast, flexible, delicious. Thanks! How did you steam the pumpkin in the IP? Did you peel or chop it? It was a small pumpkin. I put it in whole, on the rack, with a cup of water. High pressure for about 10 minutes for a 2# pumpkin. Soft when done and could easily scoop seeds and then flesh off skin. Quick. Thank you! Going to try this for dinner tonight! Hi there, I’ve got a bowl of fresh pumpkin puree in the refrigerator. Your recipe sounds good but I’m a vegetarian and wonder if substituting the beef broth w/veg broth and omitting the ham would work. I could add some mushrooms…. I think that would work nicely. I made this as written. I don’t think the ham added anything flavor wise, just some odd chewy bits. If I make this again I think I will reduce the three cans of back beans to just one. Then one may be able to taste the pumpkin. As written this is much more black bean soup than pumpkin. Ok this soup is dope. I was skeptical about the pumpkin, but I was intrigued by all the black beans and Deb has yet to steer me wrong so I gave it a shot. I’m so glad I did! The only thing I changed was skipping the shallots because I couldn’t find them but it was still awesome. Kept everything else the same and used homemade beef stock. So. Delicious. Hearty, warming, and the sherry vinegar really wakes it up. We ate it with a blop of sour cream in the middle and a slice of multigrain sourdough on the side. I froze all the leftovers like a dummy. Wish I hadn’t because I want to eat some more of this right now!! This was a rare SK miss for me. The flavors didn’t really come together. Black bean and pumpkin seemed to compete with tomato, and the vinegar was too strong. My husband and 18-month-old LOVED this soup and gobbled down bowl after bowl of it. Unfortunately, this soup (really a chili) wreaked no small havoc on their digestive tracts. So I’ve had to ration it out to them. Will make it again when I can deal with the fallout! I made this for dinner tonight. It’s the kind of soup I like, a pumpkin undertone but not a sweet creamy one note pumpkin. I followed the recipe pretty closely. I probably had more onion and shallot than was called for, my garlic cloves were quite large and I drained a can of tomatoes, but didn’t measure, just used the whole can. My store didn’t have sherry vinegar, so I used rice wine vinegar, 3+ tablespoons. The rest was per the recipe. It was delicious! The vinegar wasn’t even close to being overpowering for us. The soup won’t win any beauty contests, which I find typical of black bean soups. I will definitely make again. Thank you for a great recipe. Made this tonight. So good. Yum. Yes, a black bean soup with a bit of pumpkin. Not a pumpkin soup. I did not have shallots either, so a little red onion mixed in with the yellow. I had confidence too knowing it came from Gourmet! I see whole black beans (I think) in one picture. I’m wondering if it would mess up the recipe too much to only puree 2 cans of the beans and then add the 3rd can at the end with the ham, etc. Should work! I think I just set some aside for garnish. This recipe has captivated me and I’m going to serve it Saturday night to friends. Crusty loaf and a salad — tossed green? Composed? And suggestions for a wine pairing would be great, too. Thanks! !